Eden Turquoise coffee saucer. 5.5"Dia. 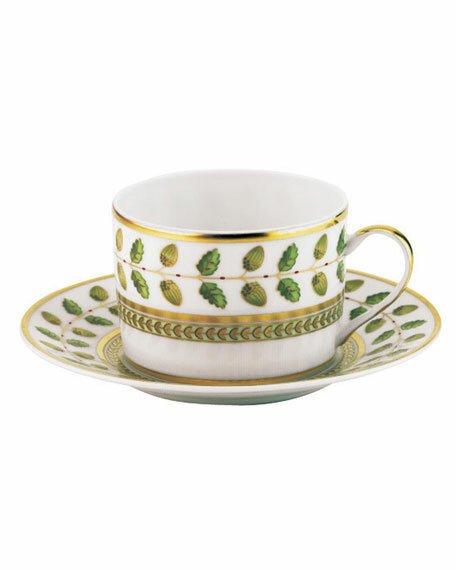 Crafted of Limoges porcelain with intricate golden engraved detail. Hand wash. Made in France. Coffee cup sold separately. Azul mouth blown glass magnum coupe glass with floral engraving. Each goblet is handmade; size and color will vary slightly. Azul mouth blown glass magnum coupe glass with floral engraving. Each goblet is handmade; size and color will vary slightly. Approx. 5"Dia. x 6"T. Hand wash. Imported.